Brythunia is a loosely-knit Hyborian kingdom of city-states. Its Nemedian frontier is the north-flowing Yellow River. Another river flowed eastward along the Brythunian side of the Graaskal Mountains and marked the northern border. The highlands in the northeast were cleft by numerous passes, through which Hyrkanian invaders poured during the years following the Age of Conan. Interior Brythunia was a land of fertile, subhumid prairies interspersed with very thick, wolf-haunted coniferous forests. Brythunia was probably primarily agricultural, with its aristocracy based upon land-owning boyars who made their headquarters in the fortified cities. The most fertile soils were found in the alluvial deposits of the interior river valleys and in the southern piedmont. The folk of Brythunia have the dubious honor of serving as traditional butts of Hyborian Age humor which paints Brythunian men as thickwitted oafs and their women as saucy and willing wenches. The women of Brythunia, mostly blonde, spirited and beautiful, are much sought after by slave traders. Modern Brythunians descend from ancient Hyperborean and Brythunian stock. Hyperboreans were stocky (like modern Shemites), with dark hair; ancient Brythunians were tall, fair-skinned and blond. Modern Brythunians are stocky, but with fair skin and blond hair. Most Brythunians live in small villages of wattle-and-daub huts. In the central regions, these villages are set into copses of trees, while in the northeastern highlands, they are perched upon the tops of high crags. Where necessary, steps and footholds are carved into the rock to ensure easy climbing, and most Brythunian villages have at least one horse-path. In the fertile central plains, farming feeds most Brythunians, but in the highlands men hunt to survive. Women remain at home, weaving, embroidering and raising children. A Brythunian widow moves in with her husband's brother or her own family. Brythunians live in many Hyborian cities, especially in Corinthia, where they work as skilled weavers and dyers. Central Brythunia is ruled by hereditary nobles who legally owe allegiance to the Brythunian king but are in fact independent. 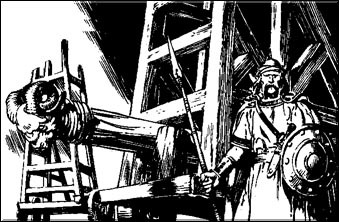 This divided leadership causes many of Brythunia's problems, and puts the king into a difficult position when bargaining with the other Hyborian nations. The Brythunian nobles bicker with one another as frequently as they ignore the throne. The difficulty of Brythunian life prevents large standing armies, but each noble maintains a few household guards" who raid neighboring steadings for cattle and sheep (or on the whim of a piqued noble). This constant infernal strife has prevented Brythunia from consolidating into a true nation. The Brythunian monarch is constantly trying to make other kingdoms acknowledge his sovereignty over Brythunian territory. However, as he has no army to draw upon, Nemedia and Corinthia generally ignore the Brythunian "King of Oafs". Brythunians in the populated central plains are usually Mitra worshipers, although there is some worship of the gods of Turan and Zamora.